Today was my first day back to school from Christmas vacation, and I'm beat! It's going to take a couple days to get in the swing of things again. I do have a card to share with you tonight. I am a BIG October Afternoon fan, and this paper line is so luscious. When I saw it the other day I just had to pick up several sheets. I couldn't wait to give it a try. 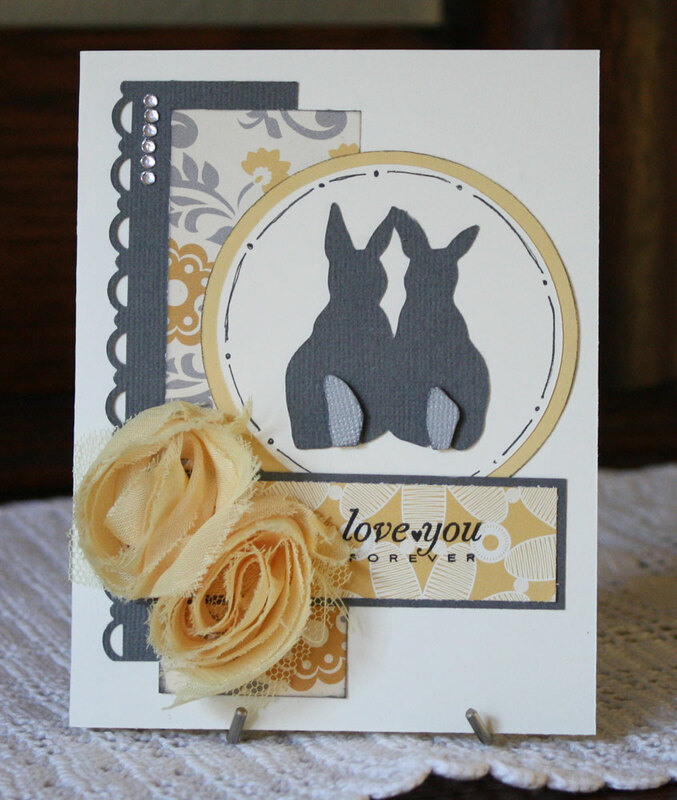 I really liked the vintage look of this paper and the yellow and gray color combination was so romantic, so a silhouette was needed to finish it off. Add a the bunny silhouette from the A Child's First Year Cricut cartridge, some of Webster's Bloomers, and a Papertrey Ink sentiment I got in my stocking for Christmas. I always have to add something a little extra to my cards. In this case I thought the bunnies needed little tails. I hand cut these from lighter gray cardstock and attached them with foam dots. This card was created to fit with a couple challenges this week. 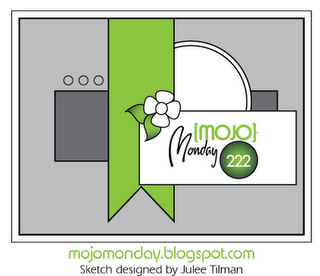 This is the Mojo Monday sketch I used for their challenge MOJO 222. I flipped the sketch and adjusted the orders of the layers to make it work for my card. Check out these three fabulous blogs. They have some great challenges and prizes! I love that line from October Afternoon. Those bunnies are so cute! I love your card. Your color combination is beautiful! Love the flowers! Thanks for joining us this week at Frosted Designs and happy 2012!! Gorgeous card! Love the colors/papers and the sentiment is too cute!